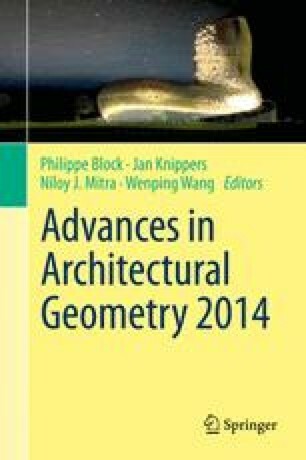 This paper builds on recent progress in computing with geometric constraints, which is particularly relevant to architectural geometry. Not only do various kinds of meshes with additional properties (like planar faces, or with equilibrium forces in their edges) become available for interactive geometric modeling, but so do other arrangements of geometric primitives, like honeycomb structures. The latter constitute an important class of geometric objects, with relations to “Lobel” meshes, and to freeform polyhedral patterns. Such patterns are particularly interesting and pose research problems which go beyond what is known for meshes, e.g. with regard to their computing, their flexibility, and the assessment of their fairness. This research was supported by KAUST base funding, NAWI Graz funding, by the DFG-Collaborative Research Center, TRR 109 Discretization in Geometry and Dynamics, through grants I 705 N-26 and I 706-N26 of the Austrian Science Fund (FWF), by FWF project P 23735-N13 and by the European Community’s 7th Framework Programme under grant agreement 286426 (GEMS).